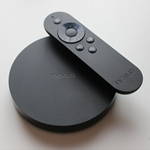 The Nexus Player is a tough sell at $99 when other set top boxes are more capable, but at less than $70? That's pretty appealing, and Google is sweetening the deal by offering $20 in Google Play credit if you buy through Amazon before May 3rd. Now that's a deal. The Nexus Player is still listed at $99 on the Google Store, where it continues to be the only Android TV device for sale. NVIDIA and Razer are both planning more capable Android TV boxes, but they're much more spendy than this Nexus Player sale price. You're effectively getting the device for under $50. The $69.27 sale price on Amazon doesn't include a gamepad, but you do get the remote. Google sells the gamepad for $40, which is a little cheaper than Amazon.